If the fashion police suddenly come up to you and say "Please come this way", you know that you made a fashion violation. A gold with black sequin blazer will get you off the hook fast. You need to change up your style in a positive way and a fashion modern fit fashion designer blazer by Pronti will help you get there. This gold with black sequin blazer has the style that works great with both jeans and slacks equally. Made of microfiber. Modern Fit. 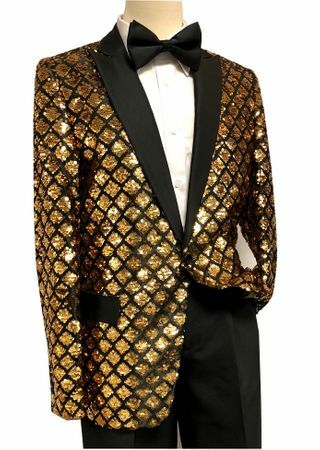 You'll look like Mr. Saturday Night in this gold with black sequin blazer.